In many approaches to the verification of reactive systems, operational semantics are used to model systems whereas specifications are expressed in temporal logics. Most approaches however assume, that the initial specification is indeed the intended one. Changing the specification thus necessitates to find an accordingly adapted system and to carry out the verification from scratch. During a systems life cycle however, changes of the requirements and resources necessitate repeated adaptations of specifications. We here propose a method that supports syntactic action refinement (SAR) and allows to automatically obtain (a priori) correct systems by hierarchically adding details to the according specifications. More precisely, we give a definition of SAR for formulas ϕ of the Modal Mu-Calculus (denoted by \(\varphi[\alpha\leadsto Q]\)) that conforms to SAR for TCSP-like process terms P (denoted \(P[\alpha\leadsto Q]\)) in the following sense: The system induced by a process term P satisfies a specification ϕ if and only if the system induced by the refined term \(P[\alpha\leadsto Q]\) satisfies the refined specification \(\varphi[\alpha\leadsto Q]\). 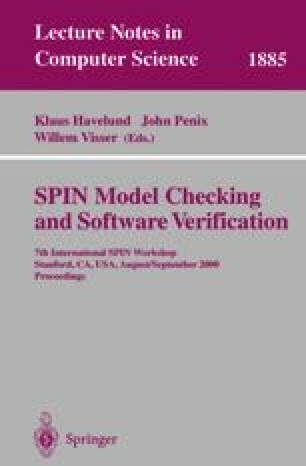 Model checking is used to decide, whether the initial system satisfies the initial specification. If we are not satisfied with the obtained refinement \(P[\alpha\leadsto Q]\) or \(\varphi[\alpha\leadsto Q]\) we reuse already gained verification information (P satisfies ϕ that is) as the basis for other refinement steps. This can be conceived as a method to reengineer systems. Syntactic action refinement allows to handle infinite state systems. Further, the system induced by P might be exponentially smaller that the system induced by \(P[\alpha\leadsto Q]\)). We explain how our results can thus also be exploited to enhance model checking techniques. Finally, we apply our results to an example.